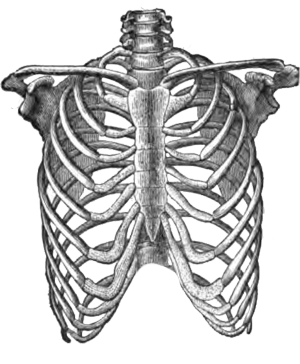 The midsection includes the clavicle (collarbone), ribs, and sternum. The collarbone (clavicle) is one of the main bones of the shoulder joint. It holds the shoulder up and, along with the shoulder blade (scapula) and acromioclavicular (AC) joint, provides stability and strength to the shoulder. The collarbone also protects nerves and blood vessels from the neck to the shoulder..
A broken collarbone is usually caused by direct contact to the collarbone or to the shoulder. This often occurs when playing sports such as football, wrestling, or ice hockey. The collarbone is one of the most commonly broken (fractured) bones. The ribs attach to a long, flat bone in the center of the chest called the sternum and attach to and wrap around the back. If a nerve in this area is pinched, irritated, or injured, pain may also be felt in other places where the nerve travels, such as the arms, legs, chest, and belly.